Today's game ended in a forced mate for Topalov. In Game 8, Veselin Topalov won his first "real" point in the 2006 Elista World Championship. Kramnik won two gameas and forfeited one because of the unresolved accusations from Topalov's team that he cheated. The score is now 4-4. 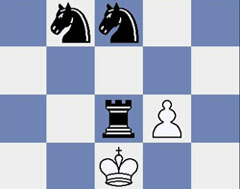 Nice technique in an endgame with two pieces for a Rook and a pawn brought home the point for the Bulgarian Super-GM. However, since the cheating debacle, Kramnik has the large majority of fan support. The match is coming down to the wire, with only four games left to go. Game 9 is scheduled for Saturday at 7 am.